Limited to 50 vehicles, the stunning matte black and satin surface finish is a first for a production Viper. 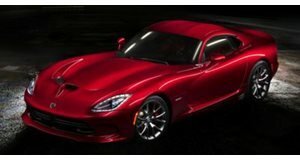 If the SRT Viper isn’t special enough for you, consider this exclusive, limited run Anodized Carbon Special Edition package created for the Viper GTS. The new, as yet unnamed, metallic matte body color is a first for Chrysler and provides a luxurious finish for the hand-built American supercar. The special edition package, limited to just 50 models, further accentuates the Viper’s sinister allure with Black Vapor Chrome five-spoke “Rattler” alloys housing orange brake calipers. Other special exterior touches include a gloss-black GTS badge, satin-black exhaust bezel, carbon fuel-filler door, and carbon-fiber brake ducts and rear applique. Interior enhancements consist of Alcantara and Nappa leather trim, orange stitching, orange and carbon-fiber accents, while a carbon GTS badge adorns the dash. The SRT Viper GTS Anodized Carbon Special Edition will be showcased at the LA Auto Show this week before going on sale in January. Pricing has yet to be announced.